48 channels with one small board! No compromises due to not having as many channels as you really want. Each channel provides 20mA of current-controlled switching. No external current limiting resistors needed. Hook up your LED(s) and go. Each channel can switch up to 15V, so several LEDs can be wired in series per channel. Refresh rate is approximately 1200Hz. Built-in intensity scaling curve for linear perceived brightness with linearly increasing DMX values ("gamma correction"). This is possible because the board actually runs at 4096 levels (12 bits) per LED. These scaling curves allow 8-bit DMX to have a wide dynamic range, with excellent "resolution" at the dimmest settings, so when slowly fading up from black you can't see the "steps". LED brightness levels retained if DMX signal is lost. DMX ID settable 1-511 via DIP switch, changes are immediate (no power off and back on needed), status LED blinks orange to acknowledge setting change. This is the starting DMX channel the board responds to; for example, if the ID is 1, the board responds to DMX channels 1 through 49. If the ID is 49, the board responds to DMX channels 49 through 97. DMX termination on/off via DIP switch. No jumpers or plugs to deal with. Run test chase pattern yes/no via DIP switch, which is very handy for debugging installations. High-resolution (16-bit DMX) mode yes/no via DIP switch. This allows the ultimate in precise dimming control with 4096 levels! Multicolor status LED indicates DMX protocol or wiring error (red), no DMX wire connection or no data on connection (green slow blink), and valid DMX frames incoming (green fast blink). Supports the top speed possible with DMX: 512 channel frames @ 44fps. LED connection headers are a unique "pluggable" design: they can be unplugged from the board, wires added/removed, then plugged back in. They can be plugged in two ways: such that the wires exit up out of the board (shown in in picture) or more conventionally parallel to the board. This allows for much easier installation and for moving installations, since the board and the LED clusters are easily separated. Board electronics runs from 6-15V DC @ 125mA with LEDs off and 1200mA all-on, reverse polarity protected. Contact if 75% or more LEDs will be full on for more than 30 seconds at a time and you are using more than 9V, as there are thermal concerns. 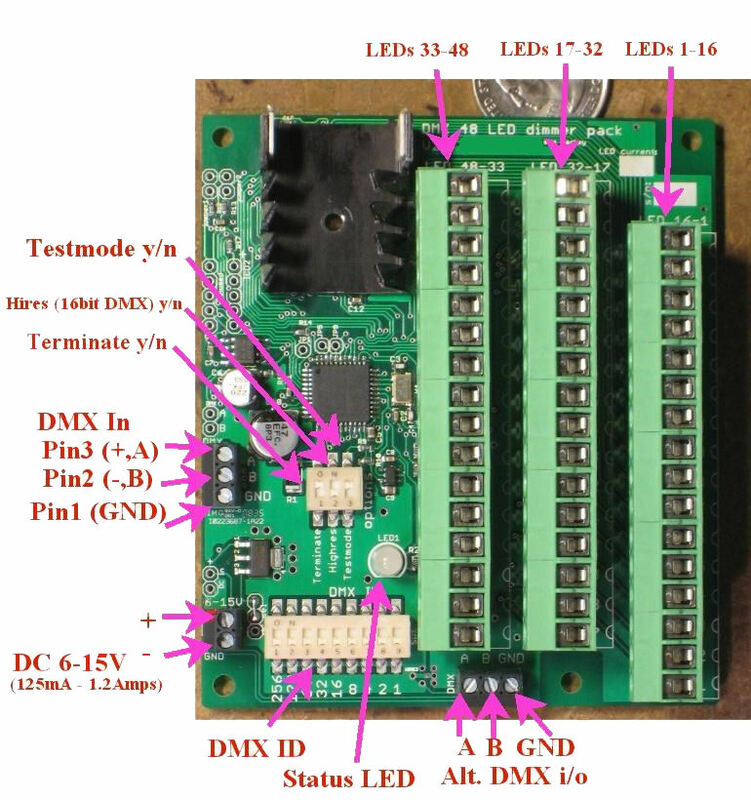 The DMX and DC power input have plated input holes on the board (in addition to the terminal blocks) to allow wires to be directly soldered to the board if desired. 11 of these boards can be run from a single DMX source, so a complete DMX universe of 512 channels can be easily built. Produto adicionado ao nosso cat�logo Quarta 07 Janeiro, 2009.